Tara arrives at Steed's flat to find that she can hear him, but can't see him. Turns out he is hiding behind the sofa. "My tuba has sprung a leak," he explains. Enemy agents are escaping from a high-security prison, each with a single target, and the first two happen to be Steed's best friends. Then the ringleader—the most dangerous of the bunch—calmly announces that he, too, will soon escape... and guess who his target might be? 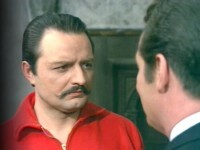 It is Peter Bowles' fine performance that saves this one from the one-bowler bin. Despite an action-filled teaser, it is so hum-drum and unexciting that I had a hard time finding interesting images to post. Considering this episode was produced early in a season that supposedly marked The Avengers' return to "realism," the means of escape for the prisoners is pretty darned unbelievable! 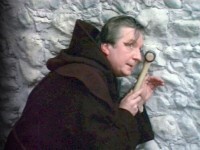 Robert Russell appeared in two Police Surgeon episodes, "Easy Money" and "Wilful Neglect." Ashridge College near Little Gaddesden was the setting for the monastery.